loveLife, South Africa's National HIV Prevention Programme for Young People, is using cell phones to fight HIV and Aids among the youth. MYMsta is the world's first cell-based social network for youth empowerment and HIV prevention. 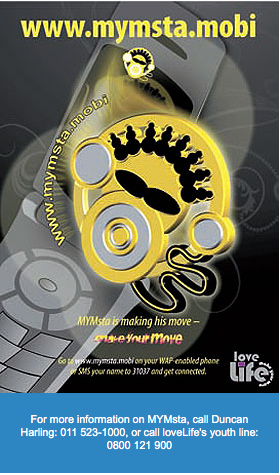 In a move to prevent HIV infections among youth, loveLife started MYMsta in June 2008. Those with WAP-enabled cell phones can join MYMsta on www.mymsta.mobi and access a range of information. loveLife set up the MYMsta mobile social network because almost 75 per cent of South African youth have access to cell phones, while only 6 per cent have access to the Internet. MYMsta is a call to young people to "Make Your Move". The Make Your Move campaign comes from studies which show that young people do get the message about HIV prevention. But what continues to drive HIV is not their response to the message, but their response to their circumstances. 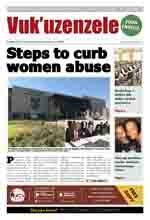 The belief that they have limited opportunities is the main driver of the HIV and Aids epidemic in South Africa. One of MYMsta's main goals is to link youth to volunteer programmes, bursaries, learnerships, internships and job opportunities. Young people who feel they have opportunities are more likely to protect themselves from HIV because they feel they have something to live for. MYMsta also offers sexual health, motivational and life skills information, world news, movies and music reviews along with other interesting features. loveLife works in partnership with the Natio-nal Youth Com-mission (NYC).